A long time ago, in the Bronze Age, there was a Leprechaun called Leafy Higginbottom. Like most Leprechauns he was a German who immigrated to Ireland and was transformed into a magic little gnome guy by the Evil Wizard Blargh and was forced to live in a Leprechaun internment camp. Unlike most Leprechauns, Leafy had twelve toes; one on his left foot, ten on the right. Leafy’s parents had raised him with a strong sense of Leprechaun pride. He studied Leprechaun history, spoke fluent Leprechaun German and knew the secret Leprechaun martial art, Top Fo Dlog. He was well liked by the elders of the Leprechaun internment camp because of his constant desire to help out, but the other children in the camp didn’t often include him in their games. “But they don’t want to play with me, Daddy.” said young Leafy. The two of them headed to the part of the internment camp where the young Leprechauns would hang out and play basketball. Leafy was encouraged by his father to go mingle. “Hi everybody,” the shy young Leprechaun said. “What do you want, freaky-toes?” one of the other kids said. “Are you able to play basketball? With those strange toes of yours?” another asked. And so the game was on. From the beginning the other kids were impressed with Leafy’s abilities. His martial arts training made him a natural. He never hogged the ball, but when he got it he simply could not be stopped. By the time the game ended, Leafy’s team was ahead by one hundred and thirty-three points. To score the final point Leafy received the ball from Shorty, jumped into the air and travelled three meters (which for a Leprechaun is very wicked far) and slammed it into the net. Everyone within eyesight was astounded. Even the opposing team had to celebrate such a shot. All the kids soon became his friend, in hopes of hanging out with the cool kid, but stayed his friend when they saw what a truly good person he was. Leafy’s father smiled. And so time passed, as is inevitable. The children grew and Leafy retained his strongest friendships with Shorty Greentree and Riverbed Toewiggle. He also fell deeply in love with the beautiful Twinkle Shinyshine. They graduated from the poorly run internment camp schools and became active contributors to their community. They weren’t always happy in the internment camp, but they always had each other. The reason the Evil Wizard Blargh kept them locked up the way he did was in the hopes of getting the Leprechauns to give him their lucky charms. Routinely he would stroll into the camp accompanied by a large Troll named Chomp. He would get into the center of the camp and address the Leprechauns. The reaction from the crowd always came a similar way. Someone would shout “Ach Du Lieber! He’s after our lucky charms!” and some brave soul would shout out in defiance “You’ll never have them, you monster!” At this point the Evil Wizard would sic his Troll on the Leprechauns. Chomp the Troll was not really a bad guy and he was reluctant to kill, or even hurt any of the Leprechauns, but to avoid being punished by the Evil Wizard he would destroy the already pathetic homes of the Leprechauns. It had been like this for years, and Leafy eventually began forming a resistance against Blargh. A group devoted to freeing the camp’s prisoners came to be operated out of Leafy’s shelter. They trained in combat, preparing for the day they would revolt. That day came. Blargh had come to the camp the same as any other day. The Evil Wizard shouted for the prisoners to give him their power but before the usual shouts of fear could be uttered, a new shout emerged. Leafy’s voice boomed “Get him!” and a dozen Leprechauns leapt at the Evil Wizard who was shocked. “It ends now!” A leprechaun yelled. Blargh was surrounded, but deftly dodged and deflected the blows coming at him from all directions. A fist neared his head, he grabbed it. He threw one leprechaun at another. A third attempted to kick him in the face, he sidestepped and it caught another leprechaun. The Evil Wizard jumped straight into the air, and outstretched his legs. He came down atop two of his short foes. Leafy and one his allies tried to grab Blargh from behind. The Evil Wizard was able to grab both and toss them into the watching prisoners. 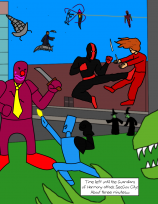 With one swift kick, the Evil Wizard was able to take out three more of the freedom fighters. Leafy got back to his feet in time to see one of his fellows take a swing at Blargh with a plank of wood, only to be knocked aside be a casual swing of the Evil Wizard’s arm. Leafy paused and clenched his fists as the Evil Wizard turned to see him. He was the last of the freedom fighters still conscious. Blargh growled from deep within his throat. The world faded away from Leafy’s eyes. He charged and the enemies traded a series of blows so quick and devastating that Leafy’s love Twinkle would later tell him that her mind couldn’t keep up with the action. Punch. Dodge. Kick. Parry. Jump-Kick. Punch-Dodge. Kick-Turn-Punch-KickParry-KickDodgePunchDodgePunchParry-punchkickturnjumpkickdodge-punchpunchparrykickparry-kickkickdodgekickjump-punchturnpunchparrykickkickkick-dodgekickFALL! The Evil Wizard kicked up a cloud of dust as he hit the ground. His nose gushed red fluid. His eye twitched in pain. He snarled in confusion. Leafy’s eyesight was blurred by blood rushing from a cut in his forehead. His left fist ached, two of his fingers had come out from their joints. One of his teeth lay in a crimson puddle in his mouth, attached to nothing. His head throbbed. He spoke. The Evil Wizard reached to Chomp the Troll, who hesitated but helped him to his feet. Blargh limped as he started to leave. He turned back to the crowd, and in particular to Leafy. By nightfall, the number of guards surrounding the camp had tripled. Months passed. Leafy’s rebel movement fought the guards on numerous occasions. The guards would tell the Evil Wizard of the activities of the brave Leprechauns, and in particular their leader with twelve toes. Blargh fumed with anger, but could not bring himself to go back to the camp. A night came when Leafy, Shorty and Riverbed were all alone discussing the future of the rebel movement. “We’re not getting anywhere!” Shorty complained. “We’re fighting the enemy. What more do we need?” replied Riverbed. And so, the brave Riverbed Toewiggle was the one to go. While the tunnel was being dug he spent all of his time studying the art of stealth. Soon it was time for him to get into the castle. The tunnel got him within sight of an open window. He climbed in and looked around. He was in a library. He crept silently through it’s aisles looking at book title after book title. He had hours until the head count, and would be able to get to other rooms if he didn’t find anything here. But he did. Among an enormous number of books about do-it-yourself pottery making, Riverbed found a book of blueprints for the Evil Wizard’s castle. He scanned through it and was very pleased with what he found. So pleased that he didn’t even notice when the guards approach as he tore a page from the book. The guards dragged him to the dungeon. He was visited by the Evil Wizard Blargh and told he would be executed in the morning. He was left in a dingy cell. Chomp the Troll was ordered to watch over him. Riverbed talked to the Troll. At first Chomp was reluctant to speak for fear of Blargh’s punishment, but the company of a good soul opened his heart, and his mouth. Chomp told the prisoner how he was orphaned by Blargh himself and raised to work as the Evil Wizard’s enforcer. He wanted to get away, but Blargh would kill him. Riverbed told him there was a way. “I’ll do what I can,” the Troll said quietly. He brought Riverbed something to write with, and took the page from him. After Riverbed had been taken away, never to be seen again, the Troll slinked into internment camp and pinned the note to the door of a Leprechaun’s shelter. Finding the note upon his door, Leafy began to read. Leafy’s eyes watered. His hate for Blargh tripled. He had feared the worst for his friend, but had always had hope in his heart. This letter pushed the hope away. As Leafy finished the note, a small smile made its way across his face that forced the tears rolled from his eyes down his cheeks. His friend was dead, but he could have his revenge. The entire population of the camp discussed what should be done, but one voice was so prevalent and so dedicated that no one could argue it. And so, the next day Leafy provoked a fight with one of the camp’s guards and was captured. Blargh recognized Leafy as the leprechaun who had hurt him in battle some time ago. Leafy spent days enduring the torture devices in the Evil Wizard’s dungeon. Then at midnight one night, Blargh and Chomp the Troll entered. Chomp the Troll removed the pointed shoes of the wounded Leprechaun. Blargh was confused. “I assure you I am, you godforsaken demon!” Leafy said, his eyes burning with hate. Chomp the Troll saw Blargh go ghostly pale as a look of horror came over his face. And so the Evil Wizard Blargh let out his final sound, a resonating “NOOOOOOOOOOOOOOOOO!” as a disembodied toe, floors above pushed down upon a secret button. The wicked man was then gone. Replaced by an explosion of various pieces of his former whole speeding outward in a blinding flash. As an unidentifiable piece of his former master splattered against his cheek, Chomp the Troll spoke. The Troll helped the wounded Leprechaun to his feet and the two wandered out of the dungeon and out of the castle and into the crisp air of a new day. And as the stories of that day spread through the land, so did the symbolism of a clover helping in the overthrow of evil and helping the Leprechauns keep their luck. Previoused: TV isn’t so bad.